What would you say at 8th grade commencement? Once again, I solicit your help. A couple of weeks ago I was asked to be the 8th grade commencement speaker at the elementary school where our church meets for worship on Sundays. 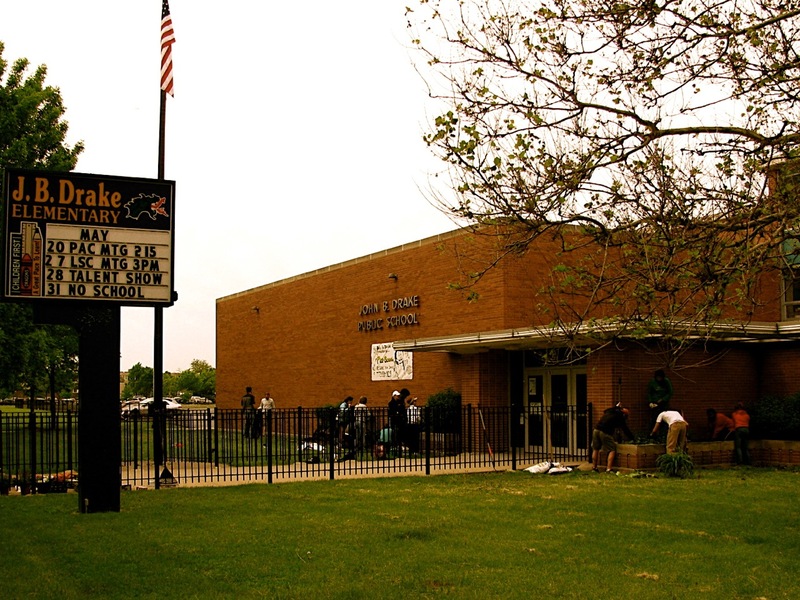 Drake Elementary, site of Monday's 8th grade commencement. This invitation elicited two responses. First, I was thrilled that the school administration trusts our church enough to ask me. Second, I had no idea what would be helpful to say to a bunch of students who are about to enter high school. It’s been twenty (!) years since I made the transition from middle school and it’s a stretch to remember the emotions and thoughts of my eighth grade self. Commencement is on Monday so I’ve already begun to work on my speech but there’s still plenty of room for your feedback. Think back to your eighth grade year. What were the hopes and fears on your mind? Assuming you actually would have paid attention to the random commencement speaker, what would have been helpful to hear? That question itself speaks to the foundational values of a public school education – that it’s about me and my potential – first and foremost. Inherent in that assumed value is competition and liberal individualism that is quite contrary to the story of God and his people. I would take the opportunity to talk about how they can take the gift of education and relationships and seek to make deep commitments to people, places and purposes. I would try and broaden their imagination for the richness of living for the peace of the city. I would challenge them to think of their identities in terms of not what they’ve accomplished, but who and where they are committed to and with. I would challenge them not to dream big (which almost always implies a kind of capitalistic success) but to dream small – in other words, deeply, locally, and with real people in real places. I would tell them to go home Monday night–after all the celebration and fanfare, after all the dinners and all the pictures, after every card has been opened and after they’ve removed their shoes–and write a letter to themselves. A letter that they would read at the end of high school. Better, a letter they’d want to read on their way to college (there’s a stronger assumption there). I’d question with them in the few minutes what types of things would be in that letter. Would there be specific people in it, particular lessons they’ve learned or wanted to learn? What would they tell their later selves to remember about big things like justice and faithfulness? Then I’d suggest that you write them a letter. Like you did to the men of nc3 last year. Read it. Maybe even give them a copy or ask the principal to make copies. In my experience speaking at 8th grade commencements, the kids don’t listen. But they may return to a letter on paper later, their own or yours. Today during service in LSquare you strongly popped into my mind. I hope you and your family are doing well! In response to this post- first of all what a great opportunity! What is most striking thinking back to myself in 8th grade I am struck by how smart and mature I was for being so small and young. Looking at 8th graders now I realize I underestimate their awareness and wisdom. When I was in 8th grade I was thrilled and also on the brink of suddenly dealing with a whole lot. I needed a lot of help though I acted like I didn’t. Here’s what I would do though I understand everyone has their own style. First of all the nice stuff- And so I would tell them that they are on the brink of a very important time in their lives. Tell them not to doubt themselves or their importance. Call them to leadership. They don’t realize it and they probably won’t believe it, but every single one of them is important. That’s why you are speaking to them. You’re not a teacher, not a relative, or family friend. You are a part of the larger community that cares. That would’ve made me think twice because I remember feeling so isolated and as if I didn’t have safe people that I needed outside of school, outside of family to reach out to. And then you gotta get tough: First of all, y’all are going to be some dang fools for the next 4 years, but that’s ok we’ve all been there. For all of you that think you are the *bleep* you’re big and tough and know it all. You don’t need no one….Word of advice: Quit frontin’. For those of you that don’t feel so great, like you need someone or you’re not important: I want you to come say hi to me today.. All of you are going to go through a whole lot of change and a lot of pressures. YOU ARE GOING TO NEED HELP. Don’t think anything is too small or unimportant. Don’t think you’re too cool or you know it all to reach out and talk to someone. Don’t play. Also, be merciful and kind to your schoolmates. Lord. 😉 Good luck. Hope this was helpful in the tiniest bit. This is great stuff! Thanks for taking some time to share your ideas. I am absolutely using a number of your suggestions. You are going to give us an update, right? Did you bore them to tears? Did they throw water bottles at you? Did you catch a kid from falling to the floor, asleep and nearly breaking his neck? Did this not happen in your Bible to some notable graduation speaker? Perhaps he wasn’t a graduation speaker. Update? Yes, in the coming days. Can’t wait to learn see what you said to the students. very cool – what a great opportunity!